I guess some of you missed this Bishan encounter this afternoon (at the time of writing, it was still Saturday evening.). I don't really blame you for that as no one from the mainstream media was reporting it, so no one was aware of it (except those who got to know this match by word of mouth). Anyway, cut that crap and straight to the point. In an odd arrangement, the game was played in three halves with 30 minutes each (man, I didn't know that there is this kind of format!!). 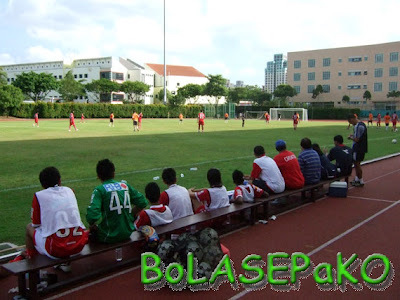 And the result was a much-improved Super Reds defeated the under-strength Home United, THREE goals to one. 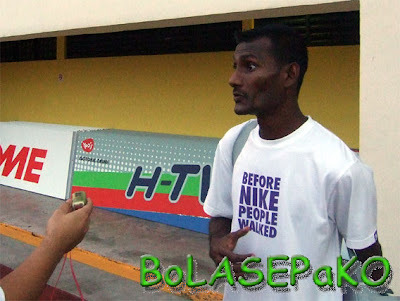 Peres De Oliveira, back at Bishan Stadium after a spell at Tampines, unleashed his trickery against the Koreans. Picture of the action taken from the stand. 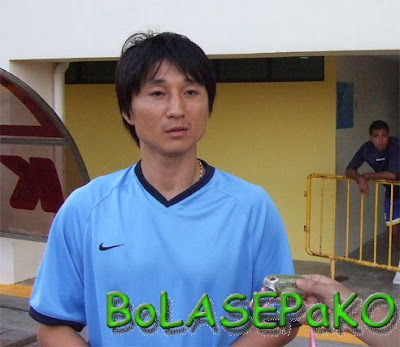 Caretaker coach (ironically former Protector as well) Jeon Kyeong Joon spent two months to comb for his current crop of players, by scouting around the whole Korea (that is that of below the 38 parallel line). Jeon also shared with us the difficulties faced by the newly-arrival Koreans, having to acclimatize to a number of issues.